Dan Mutungi who is from Machakos said he had been in the UK since 1992. 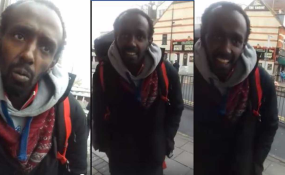 A homeless Kenyan man, who was filmed by his compatriot begging in the streets of the United Kingdom, has appealed for assistance. The man who identified himself as Dan Mutungi from Machakos said he had been in the UK since 1992. Bancy Wairimu Mbui, who was filming him, asked what help he needed and he said food and shelter. Mutungi narrated that he already lost his passport as Wairimu insisted that the best thing was for him to go back to Kenya. Wairimu had in her caption written that Mutungi begs on the streets of Luton. An article published on the Luton Today on December 16, 2016 stated that Mutungi was fined £165 (Sh21,381) for begging. "Daniel Mutungi of Noah's Enterprise in Park Street, was caught begging for alms in a passageway in George Street, Luton on July 12. He was charged partly under the 1824 Vagrancy Act. He must pay £50 plus £85 court costs and £30 victim services charge after being found guilty in his absence at Luton Magistrates on December 6," the article read in part. Mutungi, during his brief conversation with Wairimu, said his mother passed on but his father lives in Machakos. He begged Wairimu for £10 (Sh1,295) but she insisted she did not have the money and could not offer him shelter directing him to government officials instead.